Numerous studies have been conducted by CU Maurice River on the birds of the Maurice River region. These research efforts have taken place throughout the seasons, investigating the breeding birds of the river and its tributaries (principally the Manumuskin), winter bird populations, and use of the area by migratory birds in spring and fall. Also, key parcels of land have been specifically surveyed for bird presence, an important aspect of assessing the preservation potential and priority of undeveloped or threatened lands. The principal ongoing project is an investigation of the status and trends in wintering raptors and waterfowl on the Maurice River. In season seventeen, the study was extended to encompass the entire year. This study is one of very few true long-term systematic monitoring studies conducted in the Delaware Estuary. The study year July 2016 – June 2017 marked the amazing thirtieth season of these annual surveys. Ducks and geese have been counted along the tidal portions of the Maurice River for the past thirty winters, beginning in 1987-1988. Surveys have been conducted between December 1 and March 30 each season, on an average of once every ten days. In this manner, both the seasonal status and distribution, as well as overall trends of waterfowl on the Maurice River, can be assessed. In all, 36 species of waterfowl have been recorded on the Maurice River to date. Key species in the watershed include Snow Goose, American Black Duck, Mallard, and Northern Pintail. • Snow Geese are found in the salt marshes on the lower river, with 5,000 to 10,000 found each winter. The peak daily high count was 14,000, recorded early in 1990. • Black Ducks are found in large numbers along the length of the river, with high counts of over 1,000 most winters. Peaks have been as high as 8,000 birds for this species of special concern. • Mallards and N. Pintails are found primarily on the brackish marshes of the upper river, with highest numbers in the wild rice marshes north of the Maurice River Causeway. The largest numbers are usually recorded in late winter and early spring. These species are found in numbers that vary considerably due to the severity of the winter, but peaks of nearly 4,000 Mallards and 3,000 N. Pintails have been noted. Green-winged Teal are another abundant species found on the river. Raptors (hawks and eagles) have been monitored concurrently with waterfowl for thirty winter seasons, beginning in 1987-1988. As with waterfowl, in recent years the study has encompassed the entire seasonal cycle, but we retain the ability to separate and highlight the core winter period data for comparisons over time. Raptor studies have yielded significant long-term data on the status and trends of birds of prey in the Maurice River region. Raptors are predators at the top of the food chain; accordingly, raptor numbers are a good barometer of an area’s environmental quality. 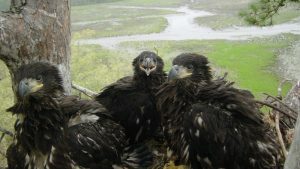 The Maurice River system continues to support one of the largest wintering hawk and eagle concentrations known in New Jersey or the Delaware Estuary region. Fourteen species of raptors are recorded most winters. • Turkey Vultures are the most numerous species found. Regional Turkey Vulture roosts support up to 300 birds each winter. 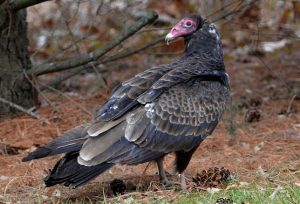 Both Turkey Vultures and Black Vultures continue to increase in both numbers and range. • Red-tailed Hawks are, over time, the second most numerous species on the winter river. Average daily counts of 40-50 birds are achieved each winter along the 14 mile stretch surveyed. Red-shouldered Hawks and Cooper’s Hawks are seen daily as well. • Northern Harrier, formerly known as “Marsh Hawk,” is an iconic species of the vast marshes of the Maurice River. Daily counts of over 40 Northern Harriers are made most winters. While most numerous on the lower river marshes, Harriers range the entire length of the tidal river. • The Bald Eagle is a hallmark species on the Maurice River and its tributaries. The numbers found here each winter are significant and generally the highest documented concentration in both New Jersey and in the entire Delaware Estuary region. Numbers have been steadily growing over the thirty years of study. Currently peak daily counts of over 30 Bald Eagles are achieved each winter, and our all-time high was 53, carefully counted on March 23, 2017. In addition to the thirty years of core winter raptor and waterfowl studies, CU Maurice River has also, for over thirteen years, conducted in-depth surveys of both fall migration and spring migration on the river. Fall migration has focused primarily on raptors, but all waterfowl and other waterbirds have been counted on each individual survey. Spring migration surveys have targeted shorebird use of the Maurice River region. Our investigations have proven that the Maurice River is important and regionally significant to migratory raptors, waterfowl, waterbirds, and shorebirds at all seasons. Click on the individual yearly reports to access the migration season data, along with the findings from the core winter surveys. The winter of 2016-2017 marked the thirtieth season that the core winter counts of raptors and waterfowl were conducted, and was the final season that these systematic studies were conducted with the long-term standardized protocols and frequency. A thirty-year report summarizes our findings, and is available by clicking here. While data is still being analyzed, some clear patterns have emerged, and status and trends for some species are readily apparent. For waterfowl, increasing species include Canada Goose and Green-winged Teal. 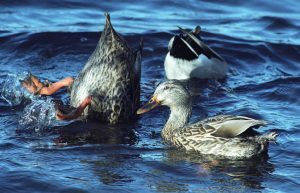 Significant declines have been noted for American Black Duck, Mallard, and Northern Pintail. In part these trends are due to the increasingly mild winters the region is experiencing, but are also linked to the loss of wild rice acreage along the Maurice River. Wild rice has been impacted by sea level rise, increasing salinity, and depredations by the booming Canada Goose populations. Among raptors, Bald Eagle, Osprey, Cooper’s Hawk, Peregrine Falcon, Turkey Vulture and Black Vulture have shown highly significant increases during the thirty years of studies. American Kestrel and Rough-legged Hawk have declined precipitously. 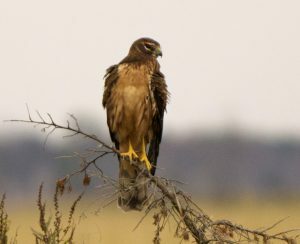 Even such river staples as Northern Harrier and Red-tailed Hawk have shown recent (if not long-term) declines in the final five years of the thirty-year monitoring. Declines in all of these birds of prey are theorized to be linked to sea level rise. Higher tides have continued to reduce the acreage of the higher marsh that supports high numbers of the rodent species that are the primary prey items for these birds. Frequent storm events have outright drowned a high percentage of marsh rodents in recent years. Lower, wetter marsh is still prevalent, but does always provide the high-quality habitat that raptors need. In short, we have seen a great deal of change in the thirty years of long-term monitoring on the river. Some changes are for the good, and some changes are problematic. Some of the changes in status and trends are clear-cut and understood; other changes are less easily discerned. Despite the strongest data possible, the complexity of the river ecosystems on the river leave some causes and effects in the realm of speculation and call for further analyses. For the Maurice River, thirty years of intensive study have given us a database of unprecedented and significant proportion, and an exceptional perspective from which to draw our conclusions on the health of the Maurice River system and the species dependent upon it. And, importantly, we have a baseline to which we can compare the effects and impacts of future changes on the river, be they man-made or natural. Against a backdrop of recent frequent and severe storms, as well as widespread and frequent drought, it is studies such as these on the Maurice River that might provide small but important pieces of the entire puzzle of climate change and sea-level rise. Sea level rise on the Mid-Atlantic Coast has been proven as accelerating and among the most severe that has been documented. Seasonal record high temperatures continue to be recorded in the Northeast and across the continent. Both floods and drought continue throughout much of the nation, impacting waterfowl productivity and raptor nesting and survival in a myriad of ways such as low rodent/prey availability. In short, climate change and sea level rise are presenting a matrix of possible scenarios and the interactions of various factors. The availability of these long-term raptor and waterbird studies on the Maurice River might play a role in understanding possible climatological causes and effects, and recent severe weather events underscore the importance of maintaining such studies over time. As the goals of this long-term project state, the key objective of these survey efforts was to discover and provide cornerstone avian resource data to be used in guiding river management, protection, and appreciation. With an amazing thirty years of studies, this goal has been substantially met. 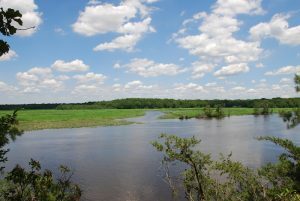 These long-term efforts have not only yielded significant insights on status and trends, they have also been used by CU Maurice River in numerous key awareness activities and advocacy efforts, including recommendations in the RTE listing process, oil spill protection, prioritization of conservation purchases, testimony in land use proceedings, and in wildlife management decision-making processes. In addition, the results of these studies have been a part of the vast matrix of information provided by CU Maurice River in our extensive educational efforts on many levels. Very few areas on the Delaware Bayshore or elsewhere in New Jersey can today offer such solid proof of environmental quality over time as can the Maurice River. CU Maurice River, through foresight and commitment to sound and long-term environmental studies, provides a solid foundation and underlying strength to their on-going protection and advocacy efforts. Such strong baselines and up-to-date knowledge yield high confidence that perceived environmental trends are either positive or negative, and that actions can and will be based on hard facts and irrefutable evidence. Radio Shorts: To learn more about the raptors on the Maurice River, check out CU Maurice River’s podcasts.